For anyone who is lactose intolerant, this four-letter word may make shudder. 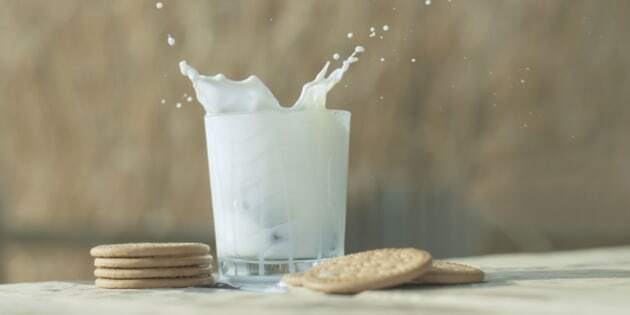 But luckily for you (and the vegans in the house), there are several dairy-free milk alternatives that won't make your stomach hurt. "Lactose intolerance doesn't mean the person needs to avoid milk products altogether," says registered dietitian Kathleen McClinton, who is based in Winnipeg. "Some products like hard cheeses contain less lactose than milk, and yogurts with 'live' or 'active' bacteria may also be better tolerated by those with lactose intolerance." Lactose is a natural sugar found in milk and other dairy products, McClinton adds, and if you're lactose intolerant, the consumption of it can lead to diarrhea, abdominal pain and flatulence. However, McClinton says by the age of 30, more than two-thirds of Canadians do not get their daily consumption of dairy/milk products in a day. Health Canada's food guide points out milk is an essential source of calcium, vitamins A and D, potassium and riboflavin. She also says going dairy-free can make it difficult to meet your daily requirements of calcium. The calcium found in one cup of milk, for example, is equivalent to four cups of broccoli or 12 slices of whole wheat bread. "Because of this, a fortified beverage like soy milk can be helpful for supplementing the diet. This may be especially important for vitamin B12, which is generally only found in animal products," she says. And nutrition-wise, McClinton says dairy-free products may not always be healthier — especially when you look at added sugars. "People who follow a dairy-free lifestyle need to read labels to compare products." To lay out your options of dairy-free milk, McClinton has come up with seven healthy alternatives. Have a go-to brand? Let us know in the comments below for an upcoming story. Of all the dairy-free milk alternatives out there in the world, soy milk is likely the most recognizable and most widely available one, says registered dietitian Kathleen McClinton based in Winnipeg. "Soy milk isn’t technically a milk; it’s a liquid extract of soybeans. Since it doesn’t contain any lactose, soy milk often is used as a substitute for people with lactose intolerance." She also adds soy milk is the only milk alternative that is recommended as a dairy milk substitute by Health Canada's Food Guide. "Its nutrition profile matches up the most closely when compared to all other milk alternatives." Soy milk is a good source of protein, and most soy foods are fortified with calcium, riboflavin, and vitamins A, D, and B12, McClinton says. Rice milk is made from boiled rice, brown rice syrup, and brown rice starch, and usually tastes sweeter than cow's milk. "Compared with dairy and soy, the rice variety has considerably less protein (only 1 g) and a very small amount of natural calcium," she says. However, McClinton notes that most brands are calcium fortified and enriched with vitamins A, D, and B12. Always check nutrition labels before you make a purchase. Another popular milk alternative, almond milk is made from ground almonds, water, and a small amount of sweetener. "Although we’d agree that eating a handful of almonds is very healthy, almond milk is much less calorically dense, and clients are often very surprised to hear it contains very little protein, and lacks most B vitamins," McClinton says. If you're looking to get health benefits from almonds, you're better off eating a handful of them. For those of you who like to bake, McClinton says almond and coconut milk are the best options because of their sweet and nutty flavours. Yes, potato milk is a thing. "Potato milk is one of the newer dairy-free milk alternatives and therefore more difficult to find commercially than rice or soy milks," McClinton says. Like rice milk, potato milk is high in carbohydrates but low in protein. Typically made from hulled hemp seeds, water, and a sweetener, hemp milk contains higher amounts of protein and omega-3 fatty acids than other milk alternatives, but still lacks in calcium. Oat milk is made from oat groats, water, and potentially other grains, beans, barley, brown rice, and soybeans. It has a mild flavour and is slightly sweet, which makes it a good substitute for low-fat or skim milk. "Just as with the other plant-based beverages, check the fortification levels. I'd also caution against its use by individuals with celiac disease," she says. Coconut milk is generally higher in calories and fat than most dairy or milk alternatives, but it also contains fibre and iron — two notable differences in the nutritional profile compared to dairy milk. "[Coconut milk is] lower in protein than cow’s milk and soy. Its strong flavour may limit its use for some individuals," McClinton notes.